Take it with you—it’s tough and sporty. With silicon protection on the sides, top and bottom of the sturdy metal frame, this unit is ready to go wherever you want to take it. With the refined design and pleasing texture, the more you play it, the better you like it. And since it’s splash-proof (IPX4)* you can use it virtually anywhere, indoors or out! Yamaha has combined a number of unique, advanced technologies in the NX-P100 for enormous power that transcends the compact size. Twin-installed SR-Bass utilizes a separate “swing radiator” diaphragm that resonates with the main diaphragm to efficiently transform bass energy to air vibrations. Also built in is Yamaha’s proprietary high-precision signal processing technology. 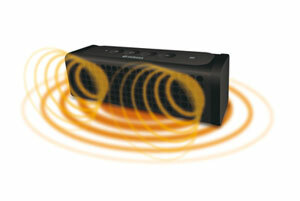 The Extended Stereo effect creates a spacious sound field. And Music Enhancer brings new life to all your music sources, including Bluetooth wireless transmissions, MP3, and other compressed sound sources—adding sparkle in the high frequencies and greater warmth and richness in the mid/low ranges. Simple and easy. No cables or docks. If you’ve got a Bluetooth® compatible smartphone, tablet, PC or other device, you can quickly and easily hear your favorite music or movies on the system. 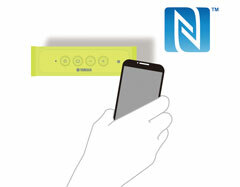 If you have an NFC-compatible device, simply hold it near the NX-P100, and the device syncs automatically. No annoying pairing settings to make—just a one-touch operation to connect or disconnect. It’s also compatible with AAC and aptX codec, so you get superior sound quality for worry-free wireless playback. The NX-P100 is your personal music-playing companion—and a whole lot more! The internal rechargeable battery lets you enjoy your music unplugged for up to eight hours. It can even be a music life-saver! 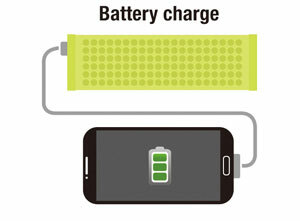 If your smartphone runs out of power, you can conveniently use the system to recharge it (via USB). An included HD Voice-compatible microphone lets you make hands-free calls with clearer voice quality, and if you have the intelligent personal assistant software Siri on your iOS device, you can start it from the NX-P100 with a single button press. When connected to a PC, the system lets you enjoy high-quality streaming music via USB, with the USB-DAC function. With all it has to offer, the NX-P100 isn’t just a portable speaker— it’s a full-featured seamless part of your music life.